Paper Mario: Color Splash is a mixed bag if ever there was one. 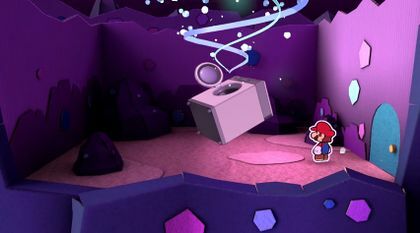 While it has a much larger and more creative world than its immediate predecessor and the trademark Paper Mario wit is still there, the game still follows many of the hated design decisions from the last game while adding some annoying mechanics of its own, leading to many heated (ahem) scraps over whether or not it's better than Sticker Star. Paper Bowser (spoilers?) does talk again, so that's something. Confirm 1-Up Mushroom behavior. The trainer probably contains relevant memory values and the inventory can also be edited by editing the save file (which is xml+crc32 appended at the end). POW Blocks do not cause any damage to enemies if they are not fully colored in. Red Mushrooms give you less HP the less they are colored in. Some environment map textures hide early screenshots. grasslandenv in BTL_ENV_Common.bfres.lz is a screenshot of an early house with a mailbox, possibly an early design for the Mario Bros. house. robj_btl_fan_envmap in BTL_ENV_Fan.bfres.lz is a distorted screenshot of an early cafe. See if the Laundry Guy's name and pre-wringing dialogue were translated into European languages. The Washing Machine thing has a different appearance between the Japanese and American versions and the European and Australian versions. To accommodate for the new design, the room it is found in is completely redesigned from a laundry room to an ordinary cave. The unique "Laundry Guy" is replaced with an ordinary Shy Guy that only appears when Mario wrings out the washing machine, albeit with the same dialogue. Because the latter only appears when he attacks Mario, the former enemy type and the line the former says if Mario talks to him before wringing it out are left unused in those versions. Today is a perfect day for doing laundry. I chucked in all the dirty stuff that's been piling up lately. The project's internal name is "gojika", according to various filenames.